The Truth For Life mobile app has been upgraded with a new look and new features. 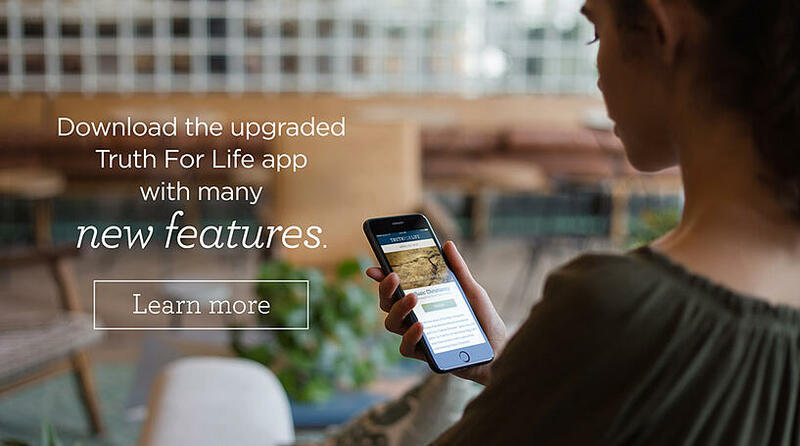 Access all of the teaching from Alistair Begg wherever you go, whenever you choose, by using the upgraded Truth For Life mobile app on your smartphone or tablet. The enhanced app takes you directly to the daily program and the daily devotional right on the opening screen. Search for a series, sermon, broadcast, or devotional by topic, title, or keyword. Browse a list of recent sermons, series, and daily devotionals that you can select to hear, watch, or read. Scroll down past the list of recent sermons or series to find teaching by topic. Download desired teaching to be saved in your new personal DOWNLOADS folder so that you can listen or watch again. Tag sermons, series, broadcasts, or devotionals as favorites to be saved in your new personal FAVORITES folder. Easily share a sermon, broadcast, series, or daily devotional with someone else through text messaging, email, or social networks. Access your truthforlife.org account through the app and see past transactions and Truthpartner information.